What is the benefit of buying marketing stanchions from this QueuePole.Economy line? 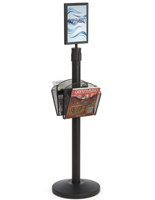 Let's start with the huge savings benefit when a crowd control post and retractable belt system offers signage and a display bin for bulk items from one fixture. 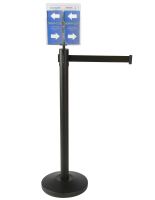 These quality marketing stanchions, also known as gallery barriers, queue lines, create sections, mark VIP areas and block access at concerts, auditoriums, convention halls, and museum events without costing a lot of money. Each of these wayfinding and merchandising solutions are typically used in night clubs, bars, banks, restaurants, travel agencies, and other retail and business outlets. 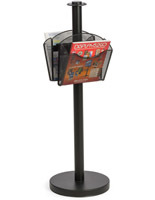 These gallery barriers for dispensing promotional literature are available at our online store at cheap prices; when purchased in bulk, the price of these fixtures and accessories drops even lower. 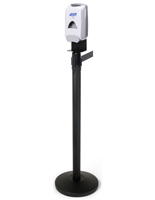 Each of these marketing stanchions is constructed of a black, powder coated steel pole and round base, with a retractable belt. Create orderly lines using gallery barriers with sign frame or brochure pocket attachments that will distribute important event or company information; block areas from public access to keep people queued properly; and do all of these things at once. 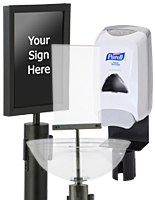 Boost branding and advertising with these wayfinding solutions with bowl displays that dispense products, mesh or acrylic pockets that distribute promotional publications, or antibacterial liquid dispensers that ensure patrons of an establishment enter and leave with clean hands. What components of these cheap gallery barriers with retractable belts are available in the QueuePole.Economy line of supplies? 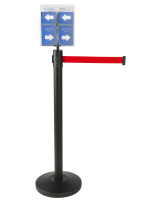 These economy marketing stanchions are dual-purpose crowd control queuing solutions that promote business by dispensing bulk items, small gifts, and other branding supplies from one fixture. 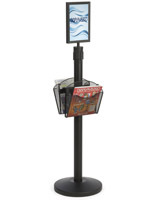 Signage overhead with a display bowl or brochure pocket underneath offers a cheap combination queuing and advertising system. Posts & retractable belts offer durable steel components with tear-resistant nylon webbing stretching 6.5 feet long. Shop our vast and full selection of ropes and accessories including a four-way adapters and post toppers at this online store. 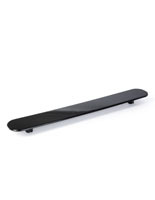 These fixtures are anchored by a round, weighted base with a rubber bottom to prevent floor scratching. 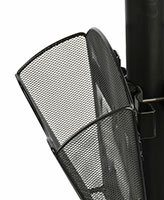 Literature pockets are offered in mesh or acrylic construction for distributing “take one” business flyers, either four levels of trifolds or two levels of magazines, go far to reinforce branding for a company or organization by keeping customers connected after leaving a venue. Wayfinding signage in portrait orientation can be filled from the top with a double-sided message that will be protected by a non-glare lens. 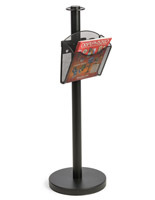 Direct patrons to an event, and tell them what items are being dispensed, with sign frame post attachments. Attach merchandising baskets and display bowls to stanchions to dispense trinkets like candy, makeup, key chains, tissues, and other small gift and bulk items at special events or in showrooms. Bin attachments are a great way to expand advertising opportunities with messaging while queuing foot traffic into organized lines. Directional accessories that dispense 1200 ml of liquid hand sanitizer can be placed in hospitals and schools for wayfinding purposes while keeping patrons germ-free. This directional holds enough product to allow 2,000 uses, and 3c batteries enable up to 30,000 uses before having to replenish. These economy crowd control systems are top quality for low prices - must-have stanchions that promote business and retail events by offering literature or promotional gifts and literature. These cheap merchandising fixtures with a retractable belt feature durable webbing that will last with frequent use. 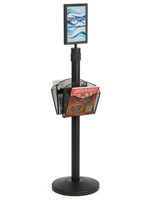 These marketing posts & ropes help generate PR with bulk merchandising dispensed from the attached bins. 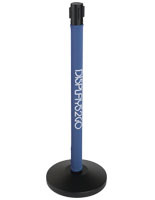 These quality stanchions for crowd control boost sales and branding. This solutions can be used in a thousand ways in a thousand venues. 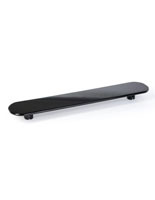 Whether it be a sign, soap dispenser, or a merchandising bin, these quality barriers are multi-purpose wayfinding tools priced to sell. 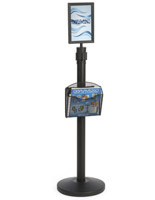 These marketing posts and ropes from Queuepole.Economy are crowd control systems with retractable belt posts feature signs for branding, bowls for storing and dispensing trinkets, or hand sanitizer attachments. Barrier displays for queuing lines are even more effective when they deliver promotional goodies that reinforce brand messaging. Be sure to include something for your patrons that will boost interest in an event and its sponsor. These dual purpose queuing systems with a retractable belt are cheap wayfinding supplies that do their job. Perhaps it’s an beautician's trade show event -- upscale beauty items and jewelry look nice in the basket attachments; or display a bowl full of key chains at an automobile expo to advertising and encourage car sales. 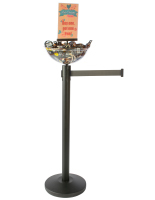 Place signage overhead to tell guests where they need to go, or inform them as to what the “take one” bin is offering. With a great design, sturdy construction, and unique attachments, these business advertising displays stand above the competition - and for a lot less. Browse the rest of our add-ons and accessories elsewhere at this website. 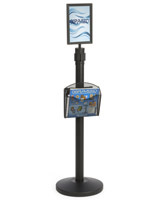 Buy wayfinding fixtures in bulk to save even more!